Wait right here! Close all the tabs that you're surfing through and read to what I'm saying. Digiarty, the leading software developer giant, is celebrating their 11th Anniversary in the Tech Industry. Specializing in media software and utility tools, Digiarty is known for their famous WinX DVD series. To celebrate this particular year, Digiarty decided to shower their love with you guys in the form of a Giveaway! Yes, you read it right. The company is offering one of leading software and partnered with other developer companies to give you a whole of more than five software giveaways on their very special occasion. Ranking in the charts of Top Media Software, you can get WinX HD Video Converter, Glary Utilities PRO, ScreenCamera, Auslogics Disc Defrag Pro and Hide my IP. Surprisingly, the Digiarty Giveaway is going to last till 6th of June, which means you'd still have a lot of time to win each of the software and try it thoroughly but first, let us acknowledge you with all the software tools and their capabilities. So, let's get started. The first off in the list is the Digiarty very own, WinX HD Video Converter Deluxe, the all-in-one video software that is an Ultra HD video converter, a YouTube Video downloader, A Slideshow maker and a dedicated video editor. The tool also lets you edit any SD, HD and 4K resolution videos on your system. With hardware acceleration algorithm, the software enables your CPU cores to work with QSV simultaneously and CUDA/NVENC for encoding and decoding videos, helping you convert videos in seconds! MPEG, MOV, MP4, WMV, RMVB, etc. WinX HD Video Converter hosts more than 400 built-in presets to convert HD and SD video formats for playing on Apple and Android Smartphones, along with Chromecast, and other streaming devices without any hassle. The device is priced at a standard $49.95 but you can get it for free during the giveaway. Next up is another useful, Auslogics Disk Defrag Pro. It comes handy to anyone who's suffering from slowed down system and does not seem to run as efficiently as it used to. If you're suffering from random slow processing, and hanged screens at regular intervals, then this is the solution. Auslogics Disk Defrag Pro quickly defrags files on your hard disk, optimizes the file placement and consolidates free space to ensure the highest data access with maximum speed possible. The tool is regularly priced for $29.95. Another one that you'll use is the Glary Utilities, an optimization software with over 20 tools. You can use it to backup and restore your entire PC, recover accidentally deleted files, repair shortcuts and registries, and optimize security with privacy, shredding and encrypting data. The whole in one is good at optimizing your entire PC, but only a few PC utility apps have this tool. Optimizing an SSD can be tricky because you can shorten the lifespan. A tool worth $20 available for free at this giveaway. ScreenCamera is a fully featured PC screen recording software. It features a simple user interface with a toolbar and few buttons that allow you to capture the entire screen or any particular part of it. It lets you easily draw over video outputs and also add a watermark in between the finalizing. Moreover, it also works as a virtual camera by which you can share your screen and webcam on multiple applications simultaneously. So, if you ever thought of starting a YouTube channel to give Tech tutorials, then now is your chance to get the right tools. It is priced at $39.95 at its official website. And last but certainly not the least, the fascinating Hide My IP is a must have VPN for every tech savvy person. It lets you surf anonymously through the web, prevent hackers from acquiring your IP address, and send an anonymous email making Internet connection safe and secure. Protect your online privacy by changing your IP with Hiding My IP. The software supports Windows, Mac OS, Android, iOS and Linux due to increasing demand. Hide My IP is priced for $29.95, but you can get all of these for free in the Special Giveaway. So, these are all the Top Media Software that you can avail in the Digiarty’s Exclusive Giveaway. The WinX HD Video Converter Deluxe is the game changer and is definitely a worthy one. But wait! It’s not stopping here. Digiarty is also offering a massive discount on their products with an Anniversary Gift Pack, offering more than 4 different exclusive software and other free gifts in the pack that is priced for $30.95 for 1 PC and $39.95 for 3 PCs altogether, instead of $159.95. So, this was all. 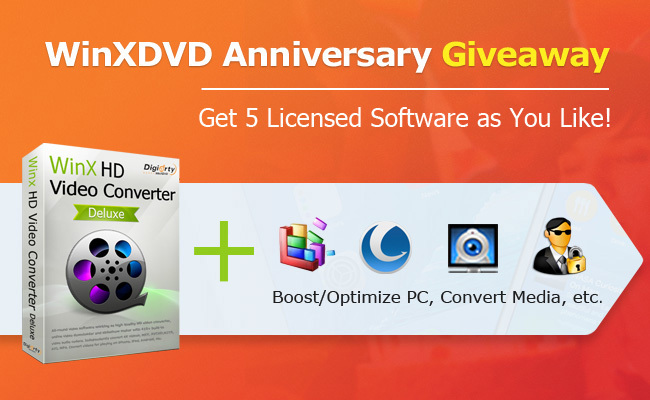 There are still 13 days till the Giveaway is over, so get yourself any of these or all of this software for free. What are your waiting for? Go on the WinX website to know more about this special exclusive Giveaway. Do share your thoughts and let us know if you’re enjoying this giveaway. Cheers!